Find out about what we have been doing recently and learn about some of our discoveries. Becoming a Lifetime member is satisfying way to make a substantial difference to WBR resources. We urge you to give it serious consideration. Your extra support will be warmly received. Now available is Sally Thomson’s fascinating book on the history of Almshouses in Wiltshire. The first comprehensive study of Almshouses in the county. Many of these buildings display fabulous architecture, and some have very early origins. 248 page book is well researched, packed with information and has 250 beautiful illustrations. The stories of their charitable founders are a treat. click here for a copy. See publications page for more WBR books. 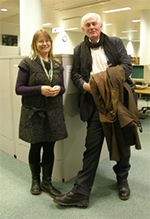 On the 11th December TV presenter and art historian Dan Cruickshank came to the History Centre to give a talk on Avebury and South Wraxall Manors. Dorothy Treasure did the initial study on Avebury Manor when the National Trust first purchased it in the mid-90s. She had a lively exchange of views with Dan on the day. Do you like taking photos? Why not get involved in our new project recording date stones and other dated features? To find out more about the project click here. WBR has been invited by Historic England to take part in an exciting new initiative to help make the online list of listed buildings more up to date and relevant. 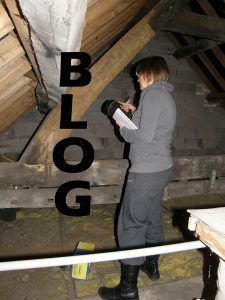 In recent weeks WBR volunteers have been searching through our archives looking for interesting historical facts about Wiltshire’s listed buildings to upload on to Historic England’s Enrich the List website. Volunteer Kylie Coles told us, “I’ve loved working on this. It’s been absolutely fascinating delving into WBR records and discovering so much detail about individual buildings. I never knew we had collected so much diverse material over the years: it’s staggering, and this project has provided a great opportunity to share it.” To learn more about Enrich the List and find out how you might be able to make your own contribution click here. Students can now join WBR at a reduced annual fee of £5. Open to anyone undertaking full or part-time courses. Students can find opportunities with WBR to be very rewarding. Please encourage anyone you know who is interested to get in touch for a dedicated student membership form. We have recently become custodians of the records of The Wiltshire Gardens Trust (WGT). Material is held alongside ours, available to view. 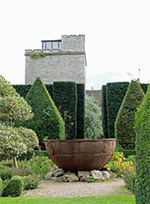 WGT members have been researching and recording gardens for their design and planting since 1986. Records contain park and garden surveys as well as all kinds of information relating to a building’s site. To find out about a specific garden, please contact us or the WGT. We have recently acquired a table display at Beechcroft Community Library in Stratton St Margaret where we will be providing information and selling books, most at discounted prices. Sales proceeds are divided between WBR and the new community facility run by volunteers. WBR specialist draughtsman Clive Carter will be available most Tuesdays. He will be delighted to see you. If you have any questions about Wiltshire or Swindon buildings and cannot make it to the Chippenham office pop in. We are thrilled about our latest book ‘Wiltshire Gate Lodges – a Guide and Gazetteer’ by James Holden . Wiltshire is blessed with 300 plus attractive gate lodges, many of which have been little studied to date. Find out more about these architectural gems, the country houses they served and gain an insight into the lives of the gate keepers who lived in them. Packed full with illustrations. Click here for a copy or see our Publications page for more information.